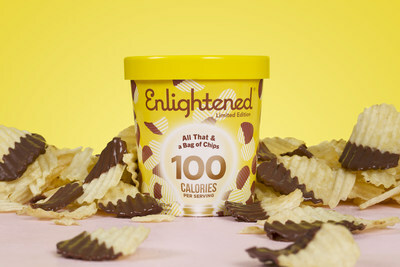 NEW YORK, March 18, 2019 /PRNewswire/ -- Enlightened, the fastest-growing brand in the better-for-you ice cream set and an early pioneer in high-protein, low-sugar ice cream founded in 2012, is thrilled to announce the launch of two savory snack-inspired new items, one pint and one novelty ice cream bar. Embracing the delicious controversiality of sweet-and-salty combos, these new flavors are an extension of Enlightened's commitment to pushing the flavor envelope, not just in the healthy ice cream set but in the entire ice cream aisle. "At Enlightened, we are committed to spreading joy through feel-good ice cream--and what's more feel-good than turning everyone's favorite late night snacks into ice cream flavors?" says Michael Shoretz, founder and CEO of Enlightened. "We love surprising consumers with quirky flavors (like Glazed Donut and Marshmallow Peanut Butter), and our fans love that we create delicious and whimsical ice cream that just happens to be a healthier option." All That & a Bag of Chips is potato chip ice cream with chocolate chips and a salted fudge swirl. * This flavor turns texture expectations upside down, converting the crispy satisfaction of a chocolate-covered potato chip into a creamy pint, with shockingly delicious results. All That & a Bag of Chips is a limited edition run, available through the summer or while supplies last, at Albertsons, Safeway, and Vons stores on the West Coast (California, Washington, Oregon, and parts of Nevada). Just like its ice cream pint counterpart, Enlightened's new Movie Night bar is popcorn ice cream with chocolate chips and a caramel swirl. ** "Our Movie Night pint has been a top-performing flavor that has introduced many fans to our brand," says Shoretz, "and we've often received customer requests for Movie Night in single-serve bar form. We love responding to customer feedback with innovation and are especially proud of this flavor, which is full of caramel and chocolate in every bite." 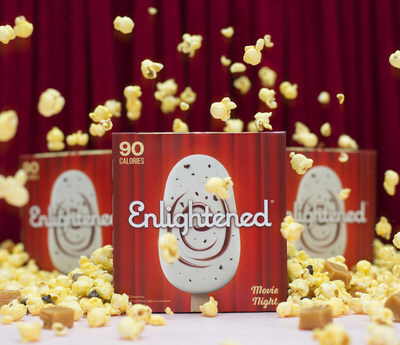 The Movie Night bar will be a permanent addition to Enlightened's flavor lineup, launching into Giant Eagle, HEB, and Schnucks this month. For lovers of sweet-and-savory flavors looking for healthier ice cream options, these new flavors are also available online via Ice Cream Source. For more information on these new flavors and Enlightened ice cream, visit eatenlightened.com and follow Enlightened on Facebook, Instagram, and Twitter. * Nutrition facts for All That & a Bag of Chips: 100 calories, 5g protein, 6g sugar, 3g fat, 5g fiber, 7g net carbs per ½ cup serving. Gluten-free. ** Nutrition facts for Movie Night: 90 calories, 7g protein, 6g sugar, 2.5g fat, 5g fiber, 7g net carbs per bar. Gluten-free. Enlightened is an ice cream brand devoted to spreading joy by creating feel-good ice cream bars and pints in exciting and delicious flavors that just happen to be low in calories and sugar. Enlightened Ice Cream, is the fastest-growing ice cream company in the US, with widespread distribution in stores like Whole Foods, Kroger, Shoprite, Publix, Target, and many more. Enlightened is the first and largest brand within Beyond Better Foods, a New York City-based company committed to creating healthier snack options across the grocery store. Inspired by his personal training clients' desire for healthy alternatives to their favorite sweet, salty, spicy and savory treats, CEO Michael Shoretz founded Beyond Better Foods in 2012. Beyond Better Foods now includes Enlightened, Bada Bean Bada Boom, and Cloud10.